So, the first event of the Bec C.C. club competition 2019 got underway on 3rd March, with a few hardy riders braving the wet and very windy conditions for two laps of the Crowhurst course (GS/382), equalling 12.7 miles in total. Four riders (Shaun K, Mark, Shaun M & Tony) took to the start line and set-off in minute intervals (apart from Tony who started two minutes later due to a mechanical on the line). Another fast ride from Tony meant he took the scratch & handicap honours on the day, exactly matching his previous best time of 33m 24s, a solid ride from Shaun Kennedy with a 38m 54s secured him 2nd in the scratch, with Mark being the next nearest to his best-time, with a 39m 37s, giving him 2nd on handicap. Unfortunately, Shaun M had a blow-out half way round the second lap which ended in a DNF. Apologies for the late posting. Enjoy the article! Our European excursion for 2017 took us to the French Alps to ride a few of the iconic Tour de France climbs. Fourteen of us made the journey, staying in Venosc, near Le Bourg d'Oisans for between 4 and 7 nights. We booked a large villa called Chalet Freeride, which provided ideal accommodation for our trip with more than enough bedrooms, large communal lounge and dining room, inside bike storage, terrace and garden for relaxing, and a self-service bar. Le Bourg d'Oisans is between Geneva and Toulouse, slightly closer to the latter. We chose to fly to Geneva as it offered a much wider choice of flights, allowing us to arrive early afternoon on day one with enough time to settle in, unpack our bikes and go for a short ride to ensure everything was in working order. Geneva had the added bonus of allowing us to meet up with our club mate Bruce who currently lives in Switzerland and was joining us for the trip. Transfers between Geneva and our accommodation were booked with Chairlift who provide an excellent service. The iconic Alpe d'Huez was our climb of choice for day one. Venosc lies about 15km East of Bourg d'Oisons which provides a gentle warm up before hitting the climbs. Alpe d'Huez starts about 5km out of Bourg and you are very soon onto the first of its 21 hairpins, all of which are numbered in reverse order which can serve to either motivate or depress depending on how you're feeling as you reach each one. The climb is 13km long and reaches an altitude of 1815m. As with all our club rides, everyone takes the climb at their own pace and we re-group at the summit or an agreed point thereafter. This is ideal as it means those that want to race up can do so, whilst others can enjoy the scenery. All 11 riders made it to the top where we posed for the obligatory group photo before enjoying some well-deserved lunch in one of the bars at the summit. After enjoying the fast descent back to Bourg, some chose to return to base while others decided to bag another climb. Turning off the D1091 onto the D526 just outside Bourg gives you the choice of staying on the D256 to ride the long steady climb to Ornon, or by taking a right hand turn onto the D221 at the foot of the Col d’Ornon you can ride the steeper climb up to Oulles. A breakdown in communication meant that two of our group took on the Col d’Ornon while five took on the climb to Oulles. It’s fair to say that those that rode up to Oulles had the harder time. It’s a relentless climb of around 9% with little or no respite and with the temperature in the high 20’s it was a very good test. The climb is 9km long reaching and altitude of 1400m. Day three saw us split into three groups. Group One took the stunning “balcony ride” by taking a right turn after the first few hairpins of Alpe d’Huez. The road climbs gently from La Garde towards the ski resort of Auris. Whilst there is plenty of climbing, this is a relatively easy ride on very quiet roads with beautiful scenery. Group Two headed to Ornon, taking the D210, which is a narrow twisty "cut in the rock" climb of around 8km with sheer drops on one side. This opens to greener terrain at the top and the dead­­-end village of Villard-Reymond. A short walk across a goat track picked up the equally narrow descent (gravel to start with) through Villard-Notre-Dame and four unlit tunnels back to Bourg d'Oisans. Group Three took on the much longer and harder ride to the Col du Galibier. This is a very challenging ride reaching a much greater altitude (2645m) and therefore tougher climatic conditions.The route to Galibier takes you first along the Vallee de la Romanche. Elsewhere this road would be considered the main road, although with little traffic in this part of the Alps and fantastic views either side it’s a great ride in itself. The road climbs steadily up to the Col du Lautaret, where you turn left to complete the final section up to Col du Galibier. The descent is fantastic, particularly the valley road again. Day four saw the whole group take on the Col de la Croix de Fer. This was the longest climb of the week being around 30km long. The first 10km is probably the toughest section at a steady gradient of around 9%. There is a downhill section in the middle of the climb and then another steady section of climbing until you reach the final third of the climb where the gradient eases and the scenery opens up with long range views towards the summit at 2067m. After a cool drink at the summit the fast descent back towards Bourg made it all worthwhile. Our base was a great place for walking as well as cycling and the three non-cycling partners enjoyed exploring the local area on foot. Note that the terrain is hard in this area and many of the paths rugged so good walking kit is a must. It was also very hot when we were there so you need to carry sun block and water. We also managed to sample white water rafting at a local centre, organised by our host, which we all enjoyed – only a couple of people fell in the river! Our reflections are that the location was ideal for a number of Alpine climbs. Chalet Freeride is about 13km outside Le Bourg d’Oisans and the ride back is predominantly uphill although nothing steep. Will is an excellent host with good knowledge of the area and also provides great home-cooked meals that were very popular. The chalet has everything you need for this kind of trip including good showers and washing machines for your kit. Transfers and accommodation were both excellent and we would thoroughly recommend both to anyone considering this type of trip. If you are planning a trip to the Alps and would like any further information, feel free to contact us via the website. As the newly elected President of the BEC Cycling Club and self-proclaimed master of the Rollers, I felt it was my duty to retrieve the club rollers from the depths of storage, dust them off and organise a roller event after what seems to be a 15 year hiatus. The Sutton & Epsom Rugby Club was picked as a venue purely because it had a bar. 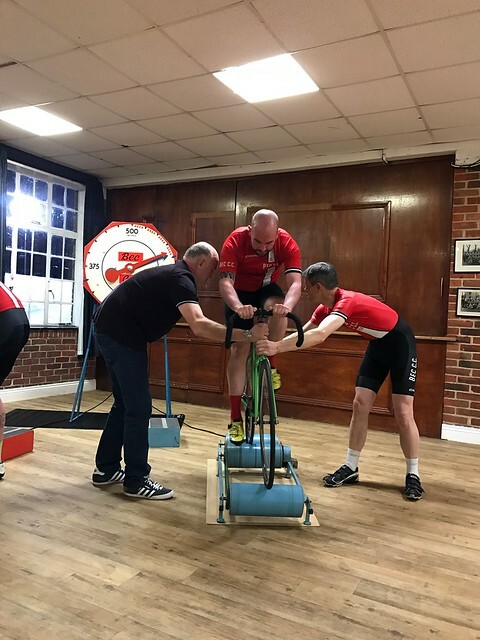 We had 10 people sign in on the night which consisted of a few experienced old hands and a few first-timers, with a mix of abilities from accomplished track sprinters to good TT riders and ambitious road racers. There was no preconceived idea of who was going to be good at this. After a period of “I can’t ride against him, we’re using the same bike”; “Can I use your bike?”; “What pedals have you got on it?”; “Has anyone got a pedal spanner?”; “Can you make the saddle lower?” we were ready to start. All five races all got off to a good clean start, there were no mishaps and everyone finished within 2 seconds of each other. There were 4 riders getting under the 19 second mark, Jason Matthiae (18.34), Jake Butler (18.43), Kieran Butler (18.78) and Rob Taylor (18.97). Most riders had an improved time however the biggest improvement was by Jake Butler who had the first sub 18 of the night with 17.73 making him the winner of the Aggregate Competition with a time of 36.16 seconds, Jason Matthiae in 2 nd with 18.64 (36.98), Kieran Butler 3rd with 18.42 (37.20) and Rob Taylor 4th with 18.56 (37.53). With handicap times calculated it was time to match people up in a head to head with the opportunity to win the scratch race. Riding off scratch, Jake Butler got his second sub 18 and the fastest time of the night of 17.65. This still wasn’t good enough for the win and he finished 3 rd behind his father, Keith Butler, with a time of 18.65 (-1.10) 17.55 winning him the Scratch Race. Shaun Marlor finished in 2nd place with a time of 19.37 (-1.80) 17.57. A great evening was had by all, and after the prize presentations it was time to descend to the bar and talk about doing it all again in October where we will hopefully get the promised Garry Beckett v Dave Sharman face off. Congratulations to Dom for winning the SCCU BAR for the fastest average speed over SCCU 25, 50 and 100 mile time trials this year, unfortunately he wasn't able to attend the Counties luncheon so Garry collected the trophy on his behalf. In club competitions, Andrew Greaves showed he's recovered from various injury's to retained his club hill climb title at this year Hill Climb. We then moved onto the speed judging competition this year's course was a couple of miles shorter due to road works and even though it's a new course nobody got lost this year, which given the events of last year is an achievement. It was tight at the top with Mark Day only 2s off his target time, the defending champion Shaun Marlor 4s off target and Shaun Kennedy third with 12s. The final event of the year was the free wheel competition where unsurprisingly Tim's rugby player mass helped him to the win. Dom Hill wins the SCCU 100 and the Bec wins the Team prize. An excellent ride for the Bec at the SCCU 100 in challenging conditions, with all four riders placing in the top 20. Dom won with a time of 4:09:32 ahead of Rupert Robinson (Crawley Wheelers) and Rob Pelham (Lewes Wanders). With a strong club finish James (4:18:38) and Andrew's (4:33:10) times completed the team award. My 2nd half took 6mins longer than 1st. I found it hard to stay working hard with the distraction of all the water, but on the other hand pushing on was only way to stave off hypothermia. Felt not too bad yesterday pm but this am everything hurts! Happy with ride in circumstances, would like to have a crack at a fast 50 and 100 with my current form. I wasn't expecting to go particularly fast, mainly due to lack of training so I was really pleased with my time. Experience counted for a lot, my pacing worked perfectly and the support team handed me exactly what I needed. I was ready for the wind and rain, so it didn't slow me too much. My ride was ok, given my decision to ride my road wheels with clinchers as an "insurance policy". My second 50 was 10 mins slower than the first, probably as a result of the heavy rain. Pleased with my ride, although it felt a bit brutal at times in the 2nd 50 trying to dodge the standing water of which there was a lot. No choice in places but to plough straight through them. I generally negative split and my legs felt wooden to start with, so even with the heavy rain my 2nd 50 was 1 minute faster then my 1st. After I'd finally got up to speed my average didn't fluctuate more then 0.1mph from 25m on! Only my 4th 100 and the first i think I've got right. PB possibly so fingers crossed I'll have got myself in the money on handicap. Ten Bec set off for a weekend in Flanders, riding the Ronde van Vlaanderen Cyclo sportive on the Saturday and watching the Pros do the same, but a bit quicker, on the Sunday. A bargain weekend thanks to the cheap cost of foreign sportives, organised to a very professional standard with traffic stopped for us at every junction, and Bruce sorting out our accommodation at an outdoor centre a mere bidon’s throw from the race’s finish line. You’re not quite sure what you’ll get when you sign up for sleeping with eight clubmates in a dorm, but the centre was modern, with good bunks and firm matresses, and everyone behaved themselves. Ian was on the official tour and staying elsewhere. Sam, Darron and Dom were doing the shorter route with a later start so the rest of us (James, Keith, Tim, Shaun, Bruce and Andrew/me) made sure we made enough noise to wake them up when we set off at 4.30am for our transfer to Bruges for the full distance start. It looked like we’d have a nice day for the 240km but on the coach to Bruges the drizzle started. We were therefore blessed with typical Belgian weather to ensure we got the full experience. The first 100km is a mix of some main roads, town centres and cycle paths to wind your way down towards Oudenaarde and cobbled climb central. We were unlucky to be accompanied by near constant rain which only stopped occasionally for five minutes to give false hope of it stopping for good. We mixed in and out of various groups in an attempt to keep warm as much draft and save our legs for later. At the top of a drag James and I stopped as we had lost the rest. We watched a couple of groups go passed and James phoned back to find out there had been a puncture. Cue 20 minutes of James and I dancing about and flailing our arms in an attempt to ward off the cold, meanwhile the rest were back down the road wrestling a tube change with numb fingers with everyone taking turns to reinflate the tyre as it was the only way to generate body heat. Reunited we were now swelled in numbers as Ian had caught up, having started a bit later and chased us down. There was a universal joy as the rain finally stopped after about four hours and then we hit our first section of cobbles. The first experience of pave for most of us and we quickly found out how well we’d screwed our bikes together as they battered us remorselessly. Each cobble seems to be set just far enough apart to ensure that your tyre smashes in to the leading edge of the next irrespective of how fast you try and ride them. Keith had a small off but fortunately only came away with a bruised ego and no real damage to body or bike. From here on in the cobbles and many climbs kicked in, never more than a few kilometres between either a flat cobbled section or a climb, which all bar a couple were cobbled. The climbs are best tackled seated and a brute force and ignorance approach seems to work better than any dainty dancing on the pedals. That said with a most climbs peaking at between 12% and 20% seated isn’t always an option, although it became more of a bike wrestling match than stylish souplesse on the steep sections. With all the climbs being fairly short it’s like doing repeated all out intervals. We smashed, bashed and wrestled our way up and over every climb, only being annoyingly forced to walk at the top of the Koppenberg when a couple of riders fell in front of us. Being so narrow there is just no room to pass and everyone behind was forced to put a foot down and then walk, not easy on a 20% section of pave! The final climb is another brutal cobbled 20% affair, the Paterberg, but once over this you get a smooth 10km run in to the finish. James got his tail up here and was impervious to the raging block headwind as he hammered through it to the finish at a steady 20mph. Keith and I managed to grab his wheel and clung on like limpets, unluckily the rest of our group missed this train but rolled in together just behind us with Tim’s rear wheel tinkling to the sound of a broken spoke and his joy that it only happened 4km from the finish. The final run in being fully set up for the following day’s race meant we got the full experience, barriered finish, advertising hoardings, finish gantry, the only thing we missed was being able to get up on the podium. 240kms, including 9.5kms of flat cobbles, 14.5kms of climbing – 12kms of which are cobbles. 9.5hours ride time. Finish line photo, and then back “home” to catch up with the others. Dom had guided Sam and Darron round with plenty of advice and fixing Sam’s bike when she was knocked off by someone less adept than her at riding the cobbles. They had had to put up with the same rain as the rest of us for the whole of their ride, the shorter route not the easy option, it takes in every one of the cobbles and climbs just missing off the run down from Bruges. The Sunday started with a pack up before heading off to Brakel which is on the edge of one of the loops the course covers. We found a great cafe to enjoy food and drink and watch the race with locals. When the Pros were on their way we walked just outside the town to catch the action live on the Valkenberg, then back down the road to the cafe and watch the finish in the packed cafe. Race over, and now our race back to Calais. It was all calm and smooth in the car and we caught an earlier shuttle, the rest in the van had a more exciting finale to the weekend. A fuel stop and a wrong turning had Darron driving through the port like he’d stolen it, bouncing over speed bumps and just squeezing through the barrier as the last vehicle let on the ferry before they closed the doors. All in a brilliant weekend, now which Spring Classic are we riding next year? Northern Andrew got a "cheeky" 6th at round two of "Crits at the Park" at the Cyclopark on Saturday. Sunday was the SCCU 25 with a strong Bec showing on the start list with seven riders starting, unfortunately one DNF (the author) on a cold, windy and generally unpleasant morning. Congratulations to Ian for placing third in the handicap competition . The first weekend of open racing of the year for the Club. Northern Andrew and Bruce road the Redbridge Warmup Series, unfortunately Bruce's first bunch race was a baptism of fire with a crash delaying him at the start and was latter at the start and he was pulled out later on as a lapped rider. After getting into a break mid race Andrew held on until the last lap to finish 20th. Then Sunday morning Keith and Stephen lined up for the SCCU 21 Hardriders with two laps of the Bletchingley circuit in cold and wet conditions. Both riders felt they could have gone better if wasn't for the conditions, Keith with a 1:03 and Stephen a 1:14. It was the SCCU Sporting weekend around Oakwood Hill with the 10 on the Saturday afternoon with the trio of riders finding a strong headwind on the A29 leading to slower times than last year. Stephen probably won his only prize in a time trial this year with a bottle of wine in the lottery at the end of the event. Sunday brought two time trials for the Club, with Andrew and Dom riding the SCCU Sporting 25 with the rarity of sheep stopping traffic through Ockley. Andrew also netted the spot prize of his combined times for Saturday and Sunday being closest to one hour forty. Meanwhile 13 riders started the club TT around the Crowhurst circuit, with DC actualy making his TT debut and a PB for Sam. Meanwhile Northen Andrew and Ian road the "Cyclofait Inaugural Event" around the Ardingly show ground with Ian taking fourth place and Andrew rounding out the top ten.